As the reservoir from China's Three Gorges Dam reaches its maximum height this year, it will inundate more than 400 square miles of land. More than a million people are being moved along with homes, schools and hospitals. But this part of China is home to a unique culture, not all of which can be moved. Some parts of the culture are being saved — and some are being lost. 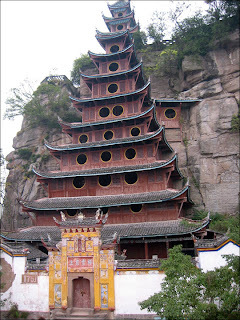 An impressive Stone Treasure Fortress dominates the shoreline of the reservoir in the county of Zhongxian. There aren't any fortifications any more. The main structure is an early 18th century, multitiered pagoda with curly eaves. It's perched on a cliff looking out over the Yangtze River. On the front of the gateway is a water level marker that says 175.1 — the number of meters above sea level and the level to which the waters will rise when the dam is completed. This was once the stronghold of the Deng clan, and an ancient village once sat at the feet of the fortress. The village has now been razed and its residents relocated. One of them is Deng Shuhua, who sells drinks and souvenirs outside the site. He recounts a local legend about how the place got its name. "The legend goes that the Goddess Nuwa was fixing a hole in the sky. She was carrying some stones in a basket, when one of them dropped out, fell on the river bank and became this mountain. That's the 'Stone Treasure,'" he says. Nearby, workers cut and chisel stone, part of an effort to protect the fortress from the rising waters. Engineer Qiu Guogui works close to the site. He says the fortress will be surrounded by 222 concrete and steel pillars — and a wall connecting them will keep the river from submerging the fortress. "The fortress will become an isolated island, accessible either by boat or a connecting bridge," Qiu says. Downriver from the fortress is a temple dedicated to a third century general of the Three Kingdoms period, Zhang Fei. "The entire temple was moved with the aim of preserving it in its original form," says Wu Qiongying, a tour guide. "Every stone and brick you see here was removed piece by piece, numbered, moved and then used to reconstruct the temple."